A new Ford Escape will break cover at the Melbourne International Motor Show on Thursday. "The Melbourne International Motor Show marks the first time this new vehicle is being shown before going on sale throughout Asia Pacific later this year," said Ford Australia President Tom Gorman. "We've taken an already great product and added a new look we're confident will appeal to a much wider audience". "The new Escape exterior has been dramatically refined, giving the vehicle a very stylish urban SUV look". "It has a distinctive Ford DNA, and now more closely resembles its best selling bigger brother, the multi-award winning Ford Territory," said Mr Gorman. Externally, the new Escape boasts a new grille, comprising three horizontal bars with a bright finish, matching seamlessly with the new bonnet complete with bright front edge garnish and new feature lines. A freshly styled front bumper, incorporating an updated skid plate on the XLT Sport and Limited models, houses recessed circular fog lamps which match the stylish new four chamber chrome-ringed headlamps, encased in a smoked housing. On the range-topping Limited, the turn indicators are now housed in the side vision mirrors, providing improved visibility. At the rear, a new tailgate garnish is complemented by a new rear bumper – incorporating a skid plate on the XLT Sport and Limited models – housing rear fog lamps and a new rear combination LED lamp. Three new wheel designs complete the exterior look, with a new seven spoke 16-inch alloy design for the XLT V6 Sports, a new three spoke 16-inch alloy wheel for the four-cylinder XLT and a new six-spoke 16-inch steel wheel for the entry level four-cylinder XLS. Rear disc brakes will be standard across the new Escape range. 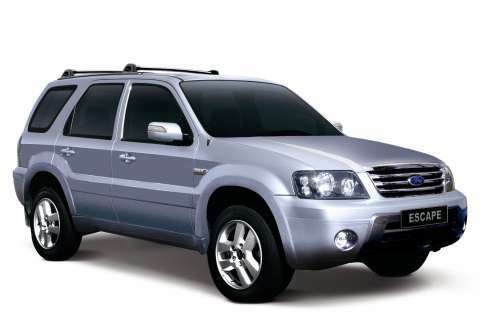 Mr Gorman also announced a revised line-up for the ZC Escape, with the XLS V6 and XLT V6 replaced by a new XLT Sport V6. "The new line-up will consist of the Escape XLS four cylinder, Escape XLT four cylinder, Escape XLT Sport V6 and the range topping Escape Limited V6." Powertrain choices remain unchanged, with the choice of a 2.3-litre four cylinder or 152kW 3.0-litre V6, which have both been upgraded to meet the new Euro III emission regulations. The 2.3-litre litre four-cylinder engine now boasts Variable Valve Timing (VVT), improving emission outputs and also providing improved performance feel and quieter, smoother operation. "The new Escape will boast an all-new interior design, which we'll be revealing as we get closer to launch." "Having a stylish new compact SUV adds to our highly acclaimed product portfolio and provides Ford with a classy contender in one of the most competitive segments in the industry," Mr Gorman said.